Gold: Oriental Red® from Jingold (Italy). In addition to the bright red color of its flesh, visitors appreciated its pleasant and sweet taste. It has a sugar content of 20 to 21 degrees Brix. In addition, the Oriental Red® kiwi offers an exotic aftertaste that enriches the sensations. "We are very happy to win this prestigious award. It's a year of hard work for our team. We have invested a lot of energy to develop and improve our product and are very pleased that people appreciate it so much, "said Federico Milanese, the head of international development. SILVER: "Softripe® Ripening Technology" from Frigotec (Germany). A natural and energy-saving ripening technology for bananas and other tropical fruits. 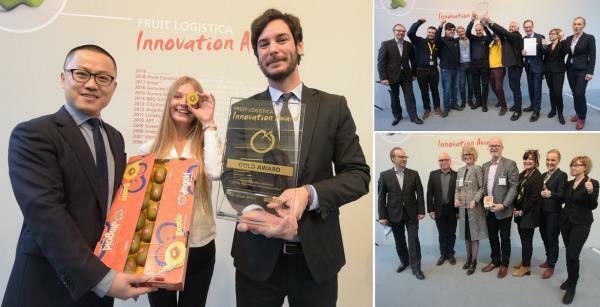 BRONZE: "Top-sealable compostable, recyclable strawberry punnet" by CKF (Canada) A wood-based container, sealable, compostable and recyclable, that can hold 350 to 400 grams of strawberries. ensures a good shelf life, without the use of plastic. Left picture: Harry Xu, Managing Director JINGOLD and Frederico Milanese, Director of International Development JINGOLD. Photo top right: the FRIGOTEC company team. Photo bottom right: the CKF company team.